Do you need a quick way to open OmniGraffle documents? 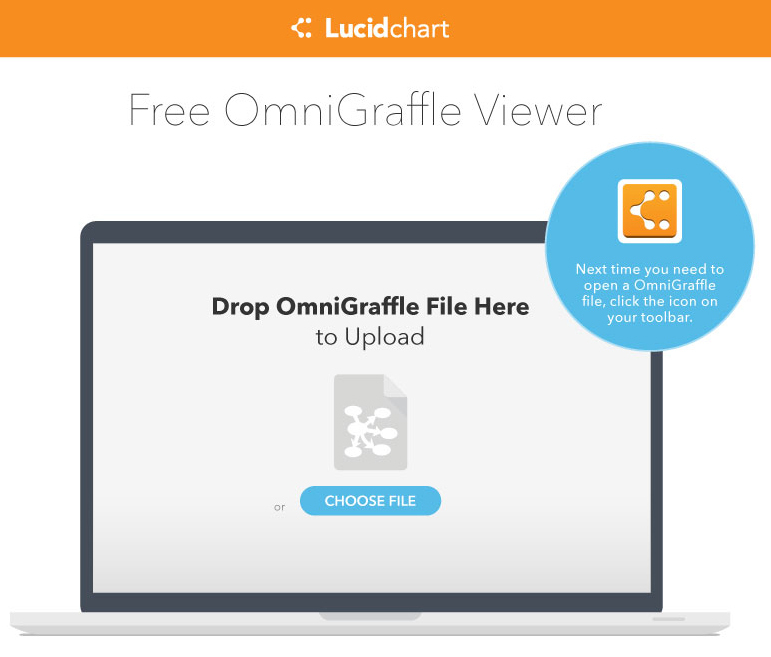 Try Lucidchart's free OmniGraffle (.graffle) file viewer for Chrome and Firefox! You'll be able to view files from your desktop, email, and the web. Open .graffle or .graffle.zip files by dragging and dropping into the viewer. Install the Google Chrome or Firefox extension (coming soon) in your web browser. Once it's installed, a Lucidchart logo will appear on your toolbar (to the right of the address bar). The next time you need to open an OmniGraffle file, click the icon and follow the instructions. Anyone with the extension can view OmniGraffle files instantly—no pricey OmniGraffle license required. It's compatible with files created in both OmniGraffle 6 and OmniGraffle Pro 6. To edit, save, or export the document to another file format, just sign up for a free Lucidchart trial. The OmniGraffle file viewer opens both local and online files. So you can choose to upload a file from your computer, or to right-click a file on the web and open with Lucidchart. Those with Gmail accounts will be able to open .graffle files directly in Gmail by right-clicking the attachment and selecting “Open in Lucidchart”. The viewer uses the same process to open online OmniGraffle documents outside of Gmail; simply right-click the file hyperlink to see its contents. And users can just as easily view diagrams on their phones and tablets as they can on their laptops. We hope you get plenty of value from the .graffle viewer. As always, happy diagramming!